A rare chance to see modern architecture from Russia, Architecton has been extended until May 8, 2010. Architecture professionals, students, and enthusiasts now have an extra week to catch the eponymous titled exhibit highlighting the firm’s designs and approach over the past decade. Be sure to stop in and see Architecton’s selection of timeless, glorious, and imaginative work. Architecton was founded in Moscow, Russia in 2001 by Alexander Zusik and Ekaterina Seregina. In ten years, more than 200 buildings have been built based on their designs. The firm focuses on project designs for residences, housing, hotels and resorts, restaurants, office buildings, and public institutions. Architecton also delves into interior design. Architecton is presented by the Embassy of the Philippines in Russia, the Embassy of Russia in the Philippines, Architecton’s local partner Philippine Russia International Development Enterprise, Philippine International Trading Corporation, and the Yuchengco Museum in celebration of 35 years of diplomatic relations between Russia and the Philippines. Yuchengco Museum is located at RCBC Plaza, corner Ayala & Sen. Gil J. Puyat Avenues, Makati City. 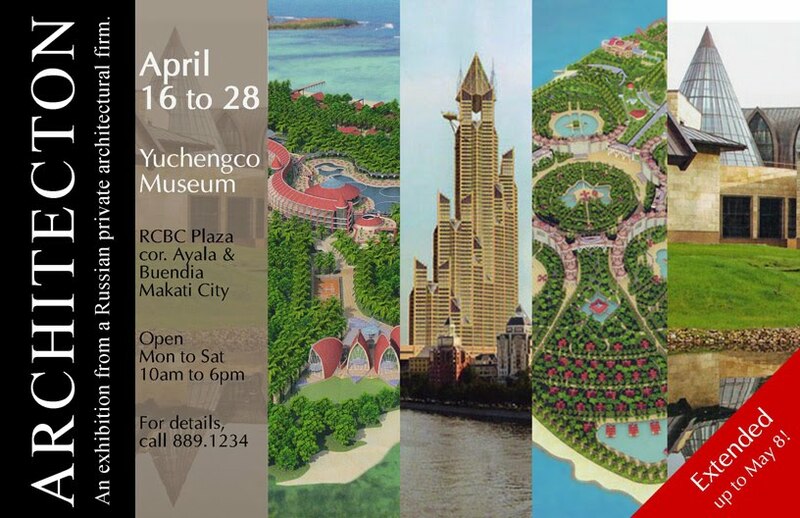 Hours are from Monday to Saturday, from 10 a.m. to 6 p.m.* For details, call (632) 889-1234 or e-mail us at info@yuchengcomuseum.org.